A peddler from the Mesabi Iron Range in Minnesota guaranteed to make "uno bellisimo ritatto" (a beautiful portrait) for my grandmother Raffaela Norcia, using several individual photos that she had. The above picture is the result, and GrandMa wouldn't want her reaction to the finished product posted on the Internet! Angiolina Gliatta Paglia, daughter of Nicola Gliatta and Carosena Costanza Gliatta sent this picture from Greci to her sister Raffaela Gliatta Norcia who lived in Minnesota. 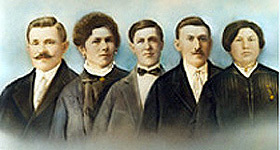 Included in the photo are Angiolina's children, Vittorio and Erminia Paglia. The message wrtten with the pictue was simple: "Dear aunt, uncle, and cousins, we are at the right of our teacher. Affectionately with kisses, Vittorio and Eminia Paglia." The Photo above was taken in Greci outside the family home. It is three generations - Erminia Paglia, Erminia's grandmother Ermina DeFilippis, and Erminia's Mother Angiolina Gliatta Paglia. This is Eugenio Lauda and Ermina Paglia's wedding photo taken on the steps of St. Bartolomeo Church in Greci. This picture is the Sons of Francesco Norcia and Raffaela Glaitta Norcia. Left to Right: Alfred, the first child born in America at Mountain Iron, MN in 1914, Matteo who was born in Greci in 1909 and Leonardo who was born in Mountain Iron, MN in 1916. This picture was taken in 1994 in Virgina, MN just a few months before Matt died unexpectedly. These two picutres are Angiolina Gliatta. The one on the left includes her son, Vittorio Paglia and daughter, Erminia Paglia. The one on the right is Erminia and Victorio some years later. Picture taken in Greci of relatives of Raffaela Gliatta Norcia. There two pictures were in Marjorie's collection of pictures but the name and connections to her family are unknown. We are publishing them here just in case someone would recognize who they are. This picture was taken in 1993 at a reunion of Greci Cugini in Wauskesha, Wisconsin. Back Row: Joyce Gliatto the wife of the late Tony Gliatto, Mike Scrima, Helen and Tony Norcia. Front Row: Carmela Scrima Gliatto, Judy Scrima Mike's wife and Dorothy Gliatto, Carmela's daughter. The photo was taken in the home of Joyce Gliato, where we all met and told our Greci Connections. Up to this point I had never met anyone else with a Greci connection. Carmela was 91 years old at the time. She was born in Greci, and came to America in the 1920's. As you can tell by the photo, she ws still in full charge of her life. Mike Scrima visted Greci in the 1960's while he was in the Armed Forces, and he had many wonderful stories to tell. Tony Norcia's parents were born in Greci, and he regretted not going to Greci with his father for a visit. Tony has since passed away. Although I didn't establish a direct familial connections with them they decided unaimously to adopt me. Since this visit I have made many connections with other people all over who have ties to Greci, Italy. This website as well as email and connecrions through a Yahoo Group where we all can share ideas have brought us all together. I am incluuding a Nursery Rhyme here. One of my relatives has written it first in Arbereshe and then she's given the English translation. Ki thotan, mos të a ngaçë se vjen tata e të bia botë ma spatan. mieri u çë jam i miar. It's just as well I'm fine.